Available to hire individually or together, with staff or DIY, our Popcorn Cart and Candyfloss Machine can provide the finishing touch to your Amercian themed event and some great fun food for your guests. The Popcorn machine can be supplied either on a cart or for table top use. The Candyfloss machine can be supplied on a cart, for table top use, or with a themed inflatable serving stall. The Popcorn Machine and cart are supplied complete with raw corn, serving bags and all other consumables required for the agreed number of portions. The Candyfloss Machine is supplied with the ready to use mixture and either serving sticks, paper cones, or plastic bags depending on your preference. Candyfloss is available in either the normal Pink Vanilla, Blue Raspberry, or Banana flavours. While the Candyfloss machine can only run one flavour at a time we can supply the other flavoursof Candyfloss pre-produced and supplied in either bags or tubs. 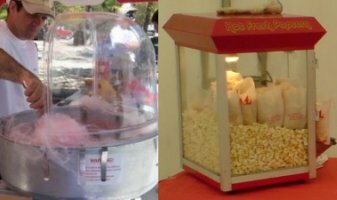 To obtain a competitive quote for the hire of the Popcorn Cart and Candyfloss machine, or if you have any queries concerning hire, then please don't hesitate to call or contact us and we will be pleased to assist you.